Despite positive statistics on the US labour market last Friday, the pair EUR/USD rose to the level of 1.3706, following slight rollback to the level of 1.3620. Neither the decline in unemployment rate to 7.0%, nor the rise in jobs outside agricultural sector and in consumer sentiment index was able to provide support to the American dollar. Euro completed last week above the level of 1.3700. Although at the opening trading session of this week the pair continued to grow, it was not able to exceed resistance line of 1.3713. Technical analysis shows that downward correction may reach the level of 38.2% Fibonacci (1.3647). The price had left the channel; however later went back into the channel; there is a candle Doji, indicating further decline in price. Resistance to the further growth will be at the summer highs of 1.3713. Support levels are 1.3674 and 1.3647. As a trading strategy I would recommend to open short positions with the target of 1.3647. 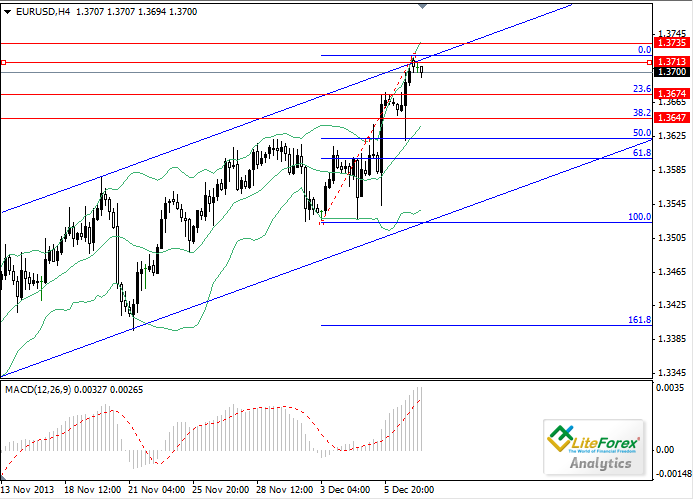 It also makes sense to place limited sell orders at the levels of 1.3713 and 1.3735.